Please see chart and info on the next page to help you make choices about options that will suit you best. 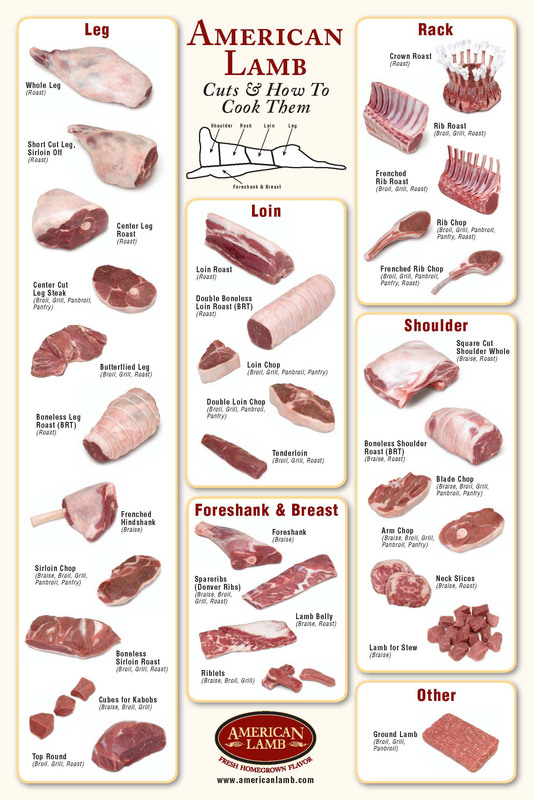 Standard cuts - Based on the American Lamb Association, these cuts are the most common. Here are the standard cuts of your lamb or goat. LEG: Whole (Bone-In) (705) If 6lbs. or less Cut in Half (Bone-In) (705) - If greater than 6lbs. *charge for vacuum packed ground lamb. How thick to cut your chops. How many chops to a package. How thick to cut your Loin chops. How many loin chops to a package. How thick to cut your Shoulder steaks chops. How many Shoulder steaks to a package.